The technology on the Regal uses a 15-kilowatt electric generator in place of the alternator and works with a 115-volt lithium-ion battery. CHICAGO -- Buick revealed its latest technology for the Regal in a century-old building in Chicago that symbolizes everything the brand hopes to be--trendy, urban and electric. Buick showed off eAssist on Tuesday in Chicago at a former power plant turned local hot spot called the Illumination Company. The technology is a mild form of electrification that helps the Regal improve to 26 mpg in the city and 37 mpg on the highway in expected fuel-economy ratings. The system was first shown in the LaCrosse at the Los Angeles auto show last year. Both cars will arrive in the summer as 2012 models. The technology uses a 15-kilowatt electric generator in place of the alternator and works with a 115-volt lithium-ion battery. The main purpose is to gather energy during regenerative braking and periods of coasting. This also works with an aggressive fuel cutoff, which cuts gasoline when the car is decelerating, and an auto start/stop system. All of this augments the 2.4-liter four-cylinder engine, which still provides most of the running power. The idea is to take basic hybrid tactics and use them to enhance the conventional gasoline engine. “We've kind of boiled down what we've learned,” said Stephen Poulos, eAssist global chief engineer. Unlike in the LaCrosse, which offers eAssist as a base powertrain option, the Regal will slot the technology in above the entry-level four-cylinder. 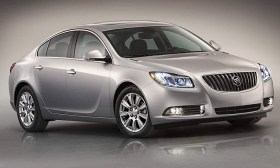 It will also carry a price premium, though Buick officials declined to say how much.